My satire about “alternative facts” from yesterday took some flak for propagating the controversial photos of inaugurations that some say are real and some say aren’t. I don’t honestly care one bit about those photos. I think it is of absolutely no importance how many people went to Trump’s inauguration; it has no bearing on how he will perform as president, and frankly I don’t know why he’s making such a big deal out of it. Even if attendance was far less than he and his people claim, it could be for two very good reasons that would not reflect badly on him at all. First, Obama’s inauguration was extraordinarily historic. For a nation with our horrific past — with most of our dark-skinned citizens brought to this continent to serve as property and suffer under slavery for generations — it was a huge step to finally elect an African-American president. I am sure many people chose to go to the 2009 inauguration because it was special to them to be able to witness it, and to be able to say that they were there. Much as many people adore Trump, it’s not so historic to have an aging rich white guy as president. Second, look at a map of the US, with its population distribution. A huge population with a substantial number of Obama’s supporters live within driving distance or train distance of Washington DC. From South Carolina to Massachusetts there are large left-leaning populations. Trump’s support was largest in the center of the US, but people would not have been able to drive from there or take a train. The cost of travel to Washington could have reduced Trump’s inauguration numbers without reflecting on his popularity. 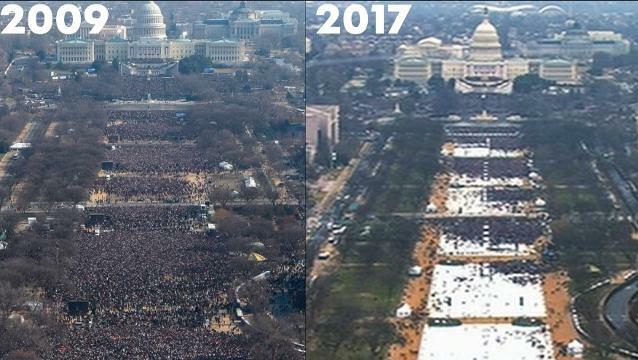 So as far as I’m concerned, it really doesn’t make any difference if Trump’s inauguration numbers were small, medium or large. It doesn’t count in making legislation or in trade negotiations; it doesn’t count in anything except pride. But what does count, especially in foreign affairs, is whether people listen to what a president says, and by extension to what his or her press secretary says. What bothers me is not the political spinning of facts. All politicians do that. What bothers me is the claim of having hosted “the best-attended inauguration ever” without showing any convincing evidence, and the defense of those claims (and we heard it again today) that this is because it’s ok to disagree with facts. If instead you give up evidence-based reasoning, then soon you have politics instead of science determining your decisions on all sorts of things that matter to people because it can hurt or kill them: food safety, road safety, airplane safety, medicine, energy policy, environmental protection, and most importantly, defense. A nation that abandons evidence is abandoning applied reason and logic; and the inevitable consequence is that people will die unnecessarily. It’s not a minor matter, and it’s not outside the purview of scientists to take a stand on the issue. Meanwhile, I find the context for this discussion almost as astonishing as the discussion itself. It’s one thing to say unbelievable things during a campaign, but it’s much worse once in power. For the press secretary on day two of a new administration to make an astonishing and striking claim, but provide unconvincing evidence, has the effect of completely undermining his function. As every scientist knows by heart, extraordinary claims require extraordinary evidence. Imagine the press office at the CERN laboratory announcing the discovery of the Higgs particle without presenting plots of its two experiments’ data; or imagine if the LIGO experimenters had claimed discovery of gravitational waves but shown no evidence. Mistakes are going to happen, but they have to be owned: imagine if OPERA’s tentative suggestion of neutrinos-faster-than-light, which was an experimental blunder, or BICEP’s loud misinterpretation of their cosmological data, had not been publicly retracted, with a clear public explanation of what happened. When an organization makes a strong statement but won’t present clear evidence in favor, and isn’t willing to retract the statement when shown evidence against it, it not only introduces immediate suspicion of the particular claim but creates a wider credibility problem that is extremely difficult to fix. As any child knows, it’s like crying wolf. If your loud claim isn’t immediately backed up, or isn’t later retracted with a public admission of error, then the next time you claim something exceptional, people will just laugh and ignore you. And nothing’s worse than suggesting that “I have my facts and you have yours;” that’s the worst possible argument, used only when firm evidence simply isn’t available. I can’t understand why a press secretary would blow his credibility so quickly on something of so little importance. But he did it. If the new standards are this low, can one expect truth on anything that actually matters? It’s certainly not good for Russia that few outside the country believe a word that Putin says; speaking for myself, I would never invest a dollar there. Unfortunately, leaders and peoples around the world, learning that the new U.S. administration has “alternative facts” at its disposal, may already have drawn the obvious conclusion. [The extraordinary claim that “3-5 million” non-citizens (up from 2-3 million, the previous version of the claim) voted in the last election, also presented without extraordinary evidence, isn’t helping matters.] There’s now already a risk that only the president’s core supporters will believe what comes from this White House, even in a time of crisis or war. Of course all governments lie sometimes. But it’s wise to tell the truth most of the time, so that your occasional lies will sometimes be thought to be true. Governments that lie constantly, even pointlessly, aren’t believed even when they say something true. They’ve cried wolf too often. So what’s next? Made-up numbers for inflation, employment, the budget deficit, tax revenue? Invented statistics for the number of people who have health insurance? False information about the readiness of our armed forces and the cost of our self-defense? How far will this go? And how will we know? I find that some people just don’t believe scientists when we point out that fundamental research has spin-off benefits for modern society. The assumption often seems to be that it’s just a bunch of egghead esoteric researchers trying to justify their existence. It’s a real problem when those scoffing at our evidence are congresspeople of the United States and their staffers, or other members of governmental funding agencies around the world. So I thought I’d point out an example, reported on Bloomberg News. It’s a good illustration of how these things often work out, and it is very rare indeed that they are discussed in the press. Gravitational waves are usually incredibly tiny effects [typically squeezing the radius of our planet by less than the width of an atomic nucleus] that can be made only with monster black holes and neutron stars. There’s not much hope of using them in technology. So what good could an experiment to discover them, such as LIGO, possibly be for the rest of the world? Score another one for investment in fundamental scientific research. Readers are probably wondering what’s become of me, and all I can say is that career challenges are occupying 120% of my time. I do miss the writing, and hope I will get back to it soon, though it seems unlikely it will be before December. So it is all the more unfortunate that today’s post has almost nothing to do with science at all. It is an apology. Will BICEP2 Lose Some of Its Muscle? A scientific controversy has been brewing concerning the results of BICEP2, the experiment that measured polarized microwaves coming from a patch of the sky, and whose measurement has been widely interpreted as a discovery of gravitational waves, probably from cosmic inflation. (Here’s my post about the discovery, here’s some background so you can understand it more easily. Here are some of my articles about the early universe.) On the day of the announcement, some elements of the media hailed it as a great discovery without reminding readers of something very important: it’s provisional! Doing forefront science is extremely difficult, because it requires near-perfection. A single unfortunate mistake in a very complex experiment can create an effect that appears similar to what the experimenters were looking for, but is a fake. Scientists are all well-aware of this; we’ve all seen examples, some of which took years to diagnose. And so, as with any claim of a big discovery, you should view the BICEP2 result as provisional, until checked thoroughly by outside experts, and until confirmed by other experiments. 1) The experiment itself has a technical problem, and the polarized microwaves they observe actually don’t exist. 2) The polarized microwaves are real, but they aren’t coming from ancient gravitational waves; they are instead coming from dust (very small grains of material) that is distributed around the galaxy between the stars, and that can radiate polarized microwaves. 3) The polarization really is coming from the cosmic microwave background (the leftover glow from the Big Bang), but it is not coming from gravitational waves; instead it comes from some other unknown source. 4) The polarization is really coming from gravitational waves, but these waves are not due to cosmic inflation but to some other source in the early universe.